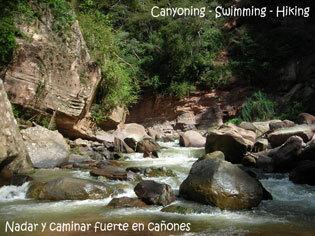 Andoriña shows in an information book not only many options for activities in town, but also relating to hiking, biking, canyoning, swimming, fishing and horseriding, with guide and independently. Regarding the guided hikes, we work (without charging any commission, you pay directly to the guide) together with a team of specialized local guides. Further information right here, but reservations of tours is also possible by phone or e-mail (4 days in advance). To go hiking wit a guide (prices start at 13 U$ per day) and biking, you can choose one the following agencies and guides, all based in the center of Samaipata. 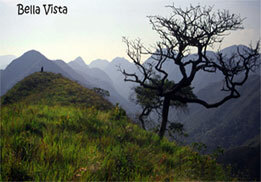 Don Gilbertro - Samaipata´s oldest and most experienced guide. 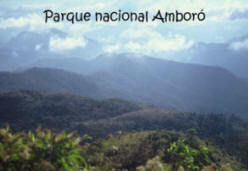 He has lived in the Amboró´s Yungas cloud forests. 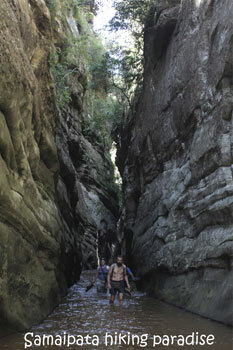 Specialised in NP Amboró, Cruceño valleys, The Condor hike, La Higuera and the old trade route to Sucre. 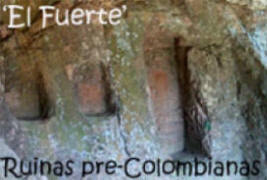 Spanish spoken. Tucandera Tours - Half a block from the square, highly recommended. 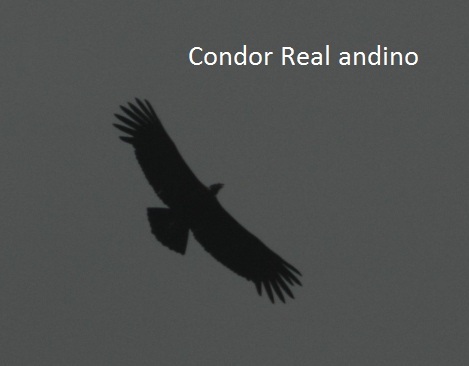 The only local guiding assocation with a biologist, Spanish, English and even German spoken. 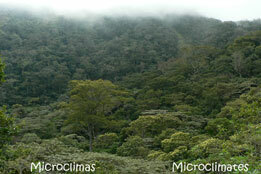 Jucumari Tours - Erwin Acuña is born in La Yunga and knows everything about the local flora and fauna. Speaks mainly Spanish. 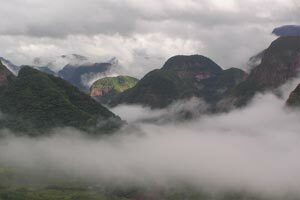 Ben Verhoef Tours is a young touroperator offering tailor made tours to all destinations, as well as the old trade route to Sucre (4 days) and to La Higuera where Ché Guevara was killed. 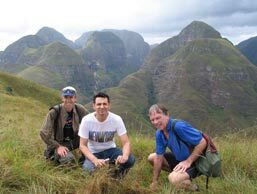 Michael Blendinger Tours - if Michael himself goes as a guide, you´ll have an excellent guide and biologist, as well a bird fanatic. Goes to all destinations, also on national level with 4x4. Sells also local arts and crafts. Roadrunners - have experienced German and Dutch speaking guides, go to all destinations. Further they have bikes for rent, a book exchange and all kind of tourist information. Samaipata Tours - Calle Bolivar. 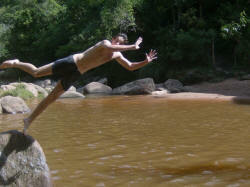 Tiburcio is an experienced guide, he can take you to all destinations. Speaks mainly Spanish. Bikes are for rent. In the same shop they sell local arts and crafts. 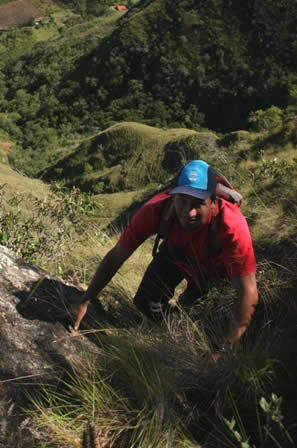 Chané Tours - Experienced Carmelo Avila Bruno offers guided adventure walks, you´ll find him often in the hostal. Mainly spanish spoken. Restaurant La Chakana - has maps of local walks Across Amboró Tours - offers 4x4 trips and hikes to all local destinations, Spanish spoken. Rent of bicycles. 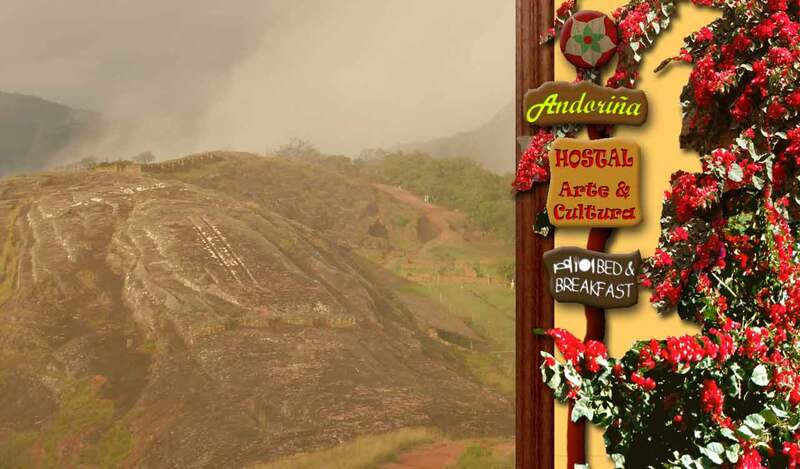 Samaipata bears outstanding witness to the existence in this region of a culture with highly developed religious traditions, illustrated dramatically in the form of immense rock sculptures. 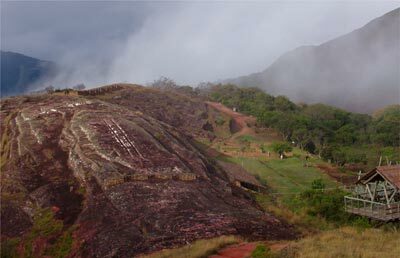 The archeological site of Samaipata consists of two elements: the hill with its many carvings, believed to have been the ceremonial centre of the ancient town (14th to 16th centuries) and the area to the south of the hill, which formed the administrative and residential quarter. The enormous sculptured rock, dominating the town below, is a unique testimony to prehispanic traditions and beliefs, without parallel anywhere in the Americas. From Samaipata itself you can arrange one or more day hikes to the fabulous area of Volcanes (only so called because the mountains to locals looked like volcanoes). 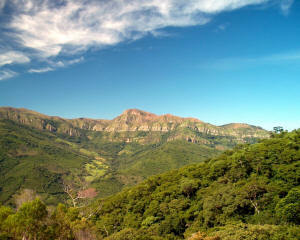 Samaipata is located at the south side of the national park Amboró (Buena Vista offers access to the north side and is more tropical). 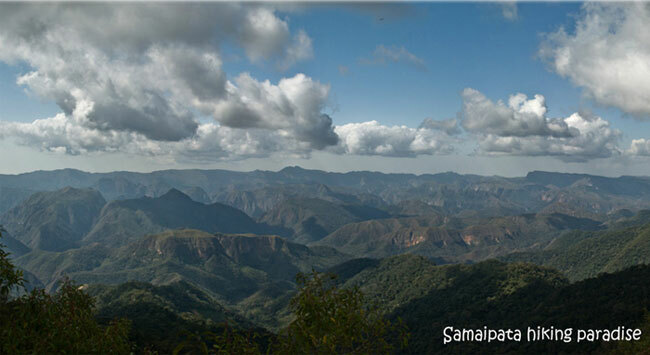 Via Samaipata one gets in the mountain area with cloud forests and the giant tree fern forest. 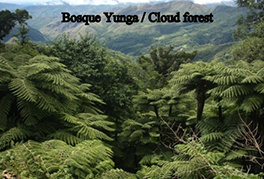 This type of forest grows above 2000 metres. 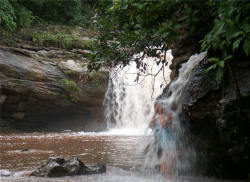 In Samaipata it's easy to arrange one up to six hour day hikes, as well as more day trips, if wished. 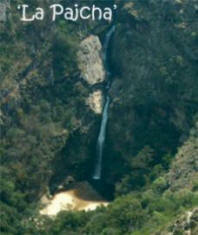 The waterfall 'La Pajcha', 'Cerro de los Condores' and 'Codo de los Andes' are still less known places. Dry mountain ranges. 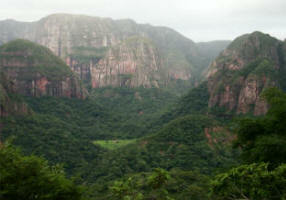 Spectacular sandstone mountains & lush canyons with high forest. Areas for everybody loving nature and adventure. 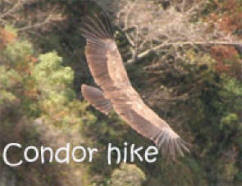 One walks 3 to 6 hours daily and it's necessary taking a guide, especially to the Condor Hike and Bella Vista. Samaipata is blessed with seven touroperators / (local) guides, including they who speak languages like English, German and even Dutch. 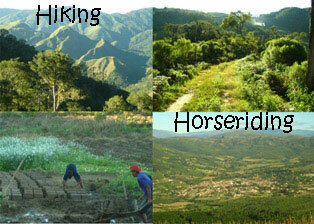 The costs per person depend on the number of persons, the type of tour or hike and touroperator. It can vary between 8-30 U$ per person. 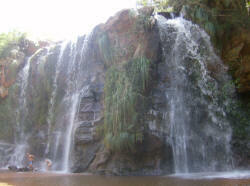 We can help you arrange a tour or hike if wished. There are areas, villages and other places to forget time and daily life. It's time to explore ! 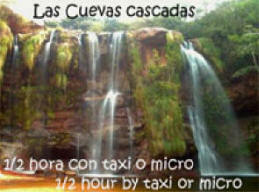 Refresh yourself in Cuevas or La Pajcha waterfalls, hike up into the mountains. 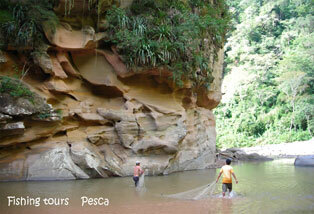 Or take a bus or taxi to villages like Pucará or Quirusillas, walk to a lagoon. More to the west is a Cactus desert, followed by Comorapa, Laguna Verde, again cloud forests and finally one of the most spectacular roads of Bolivia; the old mountain road to Cochabamba. 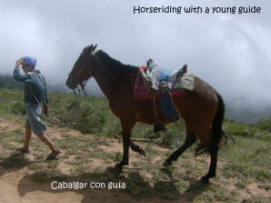 We now work together with a team of the best local guides, of which some speak English. 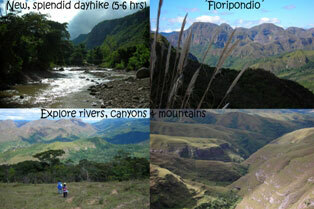 There are selfguiding hikes and regularly we organize free hikes.